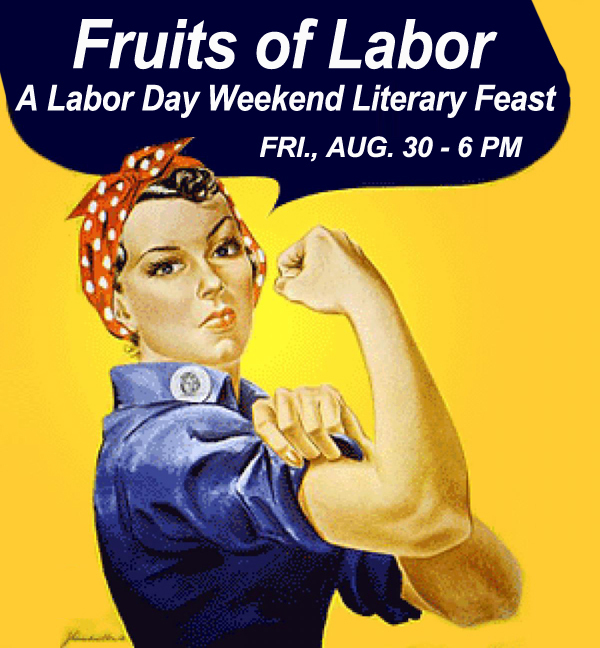 Kick off your Labor Day Weekend like never before as Three Rooms Press presents “Fruits of Labor: A Labor Day Weekend Literary Feast of Labor Movements, Labor Pains and Labors of Love,” the latest installment of The Monthly at Cornelia Street Cafe, Friday, August 30, 6pm. The event features a wide ranging group of literary artists and cultural icons, including New York Times best selling novelist Danielle Trussoni (Angelopolis, Angelology, Falling Through the Earth: A Memoir), poet/editor Laura McCullough (Rigger Death & Hoist Another, What Men Want), poet/essayist Tana Wojczuk (published in The New York Times, The Believer, Tin House), award-winning actor and movement choreographer Amanda Boekelheide, and cultural critic Ryan C. Daley. Additional special guest to be announced. Three Rooms Press co-directors Peter Carlaftes and Kat Georges host. Featured guests will provce that L-A-B-O-R is NOT a four-letter word! In a perfect world the fruits of labor are sweet indeed, from the beauty of birth following labor pains, to the beauty of fairness resulting from a successful labor movement. And a labor of love, in a perfect world, would always infer success. FRUITS OF LABOR is the latest installment of The Monthly at Cornelia Street Cafe, a unique series curated by Three Rooms Press that brings together leading poets, intellectuals, performers and budding rebels on a different topic each month. Upcoming events include: OCTOBER 4: LET’S GET KG! a celebration of October baby Kat Georges; NOVEMBER 22: JFK! NYC! OMG! an examination of conspiracy theories on the 50th anniversary of the assassination of JFK featuring Charles Plymell, Grant Hart, Exene Cervenka and more; DECEMBER 6: REVELATION: A THREE ROOMS PRESS PARTY! featuring new and upcoming books by Richard Vetere, Janet Hamill, Eamon Loingsigh, Thomas Fucularo, Lisa Panepinto and more.